“Misilla Mouse” will stimulate the curiosity and love of continuous reading and reaping rewards of enriching language skills in growth and development. 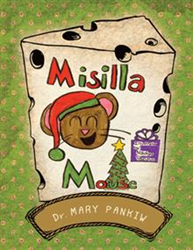 The grandmother and granddaughter team of Dr. Mary Pankiw and 13-year-old Nadya Pankiw, first-time illustrator, shared skills to bring the appealing, fascinating, fanciful children's story in “Misilla Mouse” (published by Trafford Publishing) which was published in March of 2011. This children's story tells about the activities that keep Misilla Mouse busy, as she excitedly prepares for the Christmas-fun party for her friends. This story not only enriches a child's potential and background, but also exposes the child to experience, portrayed in a positive light, by Misilla Mouse and her friends: Grey Owl, Max, the beaver, Baby Bear and all other mice. Educator, published writer, editor and poet, Dr. Mary Pankiw is the author of "Misilla Mouse," her first children's book, also in e-book.